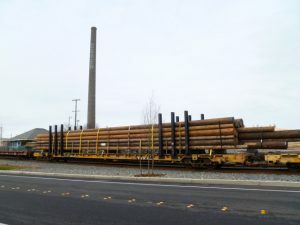 The Oeser Company manufactures Douglas Fir and Western Red Cedar utility poles in accordance with the latest ANSI 05.1 and AWPA C-1,C-4 specifications in lengths ranging from 20 to 120 feet. 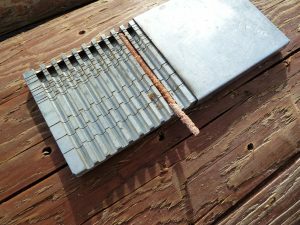 For local customers in need of meter poles manufactured to Puget Sound Energy specifications, call The Oeser Company, we’ve got you covered! Available in Douglas Fir and Western Red Cedar, we provide posts and stubs in a wide range of sizes. Pressure Pentachlorophenol treating service is available for customer provided lumber, timbers, posts, poles and even laminated wood products, for up to 120 feet in length. We provide custom peeling, drilling, framing, incising, and tagging. We machine peel poles from 20 to 130 feet in length, and up to 30 inches in diameter. 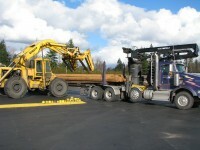 Major trucking companies specializing in the transport of utility poles are available for shipment of poles. Oeser is serviced by the BNSF railroad with its onsite rail car track.